Madeline is an eighteen-year-old girl who is literally allergic to the outside world. She stays cooped inside her sterile, protected, all-white furniture and walls home. She isn't allowed to leave and doesn't really wish to leave until she sees Olly, the new boy next door. The romance between Maddy and Olly is told through narrative, vignettes, diary entries, e-mails, illustrations and charts. 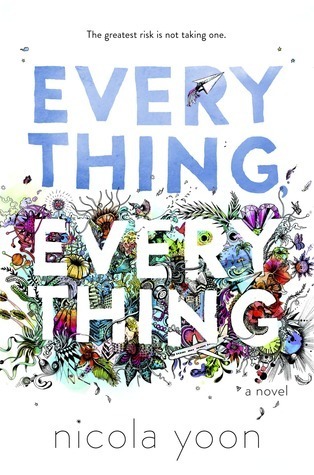 And just like that, Everything, Everything earned a spot at the top of my best reads of 2015. I had many emotions throughout the book even though I frick fracking knew the plot twist. I literally smiled and cried as it unfolded. It is not a page-turner; I mean this in a good way. It is a novel I purposely read slowly to enjoy every detail. And when I turned the last page, I was sad that the story of Maddy and Olly came to an end. The 'Spoiler Reviews by Madeline' were such a treat. The story itself is not the ordinary young love story. I don't usually do this but cannot conclude my review without acknowledging the teamwork it obviously took to publish Everything, Everything. Very rarely do readers think about the different people and process it takes before a book reaches their fingers. A big part of why I enjoyed this novel so much is because of the characters and outside-the-box storyline. But as a copy editor, I also enjoyed it because I could tell the hard work and love behind it. So well done, Nicola Yoon. So much so that I don't know how you can top this debut. Editor Wendy Loggia, you believed in a good one! Thank you for sending ARCs out into the world because Madeline's story found its way to me and moved me, as you hoped it would. I can only hope my review encourages others to read and pass it along. And how awesome is it that the author's husband, David Yoon, is a writer and designer. He did a great job with the illustrations in the novel. Usually I skip right over charts, images and such but those in Everything, Everything caught my eye and wouldn't allow me to skip the page. I can't say more praise about this upcoming novel without spoiling the plot. Just know that Everything, Everything is. every. thing. Everything, Everything will be published on September 1, 2015, for young readers. Listen, bookhearts. No matter your age add it to your TBR lists, Amazon pre-order, or NOOK wish list now. It is so worth your coins. Support this author of color! I know September seems like a long way from now so I will be sure to remind you of its release. Thank me later. I also loved this book! It's definitely going to make my top ten list this year.